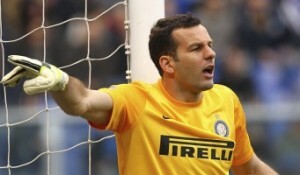 Reports are out claiming that Inter Milan goalkeeper Samir Handanovic is being linked with Barcelona. Corriere dello Sport revealed that the Spanish giants were preparing a bid for the goalkeeper as a replacement for Victor Valdes. However club representative Claudia Pastorello said : “We’ve never had any contact with Barcelona,”.